A beautiful vintage style convertible Beauford wedding car. 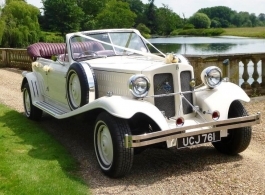 The Beauford is one of the finest and prettiest wedding cars you will see in and around London. Vintage in style but with modern engineering the car is great for navigating through the streets of London and will certainly turn a few heads.